If you are looking for black tungsten rings, we offer ring designs that combine the strength and weight of tungsten with the urban chic associated with black tungsten: black ceramic. 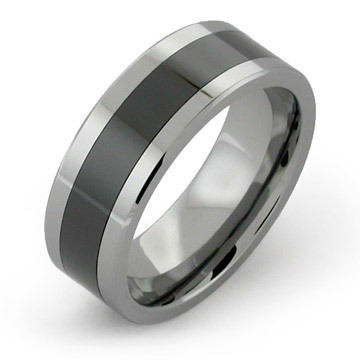 Black tungsten gets its color primarily from the manner in which deposits react to the metal when it was treated, giving the surface of the ring a black finish. While tungsten rings are strong and extremely durable, some of the surface may get scratched off over time, revealing the deep gray color of tungsten beneath. Black ceramic, on the other hand, gets its polished black color from the way the ring itself is made. A specially formulated high grade ceramic powder is combined with coloring agents and baked under extreme pressure to create a piece that has its color fused into it all the way through. It is lighter than titanium and stronger than tungsten so you won’t have to worry about damaging the beautiful finish when you go about your day-to-day activities. If you’re looking for hip, modern rings that fit your active lifestyle, then our black tungsten rings are the perfect pieces for you. By marrying the toughness of tungsten with the beauty and sheen of black ceramic, we’ve created subtle, yet beautifully designed rings that are laid back and cool, but can withstand even the most strenuous of conditions. And for those of you who have sensitive skin and are worried about how your skin will react to the materials, that won’t be a problem because both tungsten and ceramic are hypoallergenic, so these black tungsten rings won’t cause any skin reactions. The solid black ceramic rings we carry showcase the beautiful material, which is said to look like black diamonds. If you prefer something with a more unique or eye-catching design, you might want to opt for tungsten rings with the black ceramic inlay. Either way, whatever your lifestyle, one thing is for sure, you won’t have to worry or fret about scratches or damage. 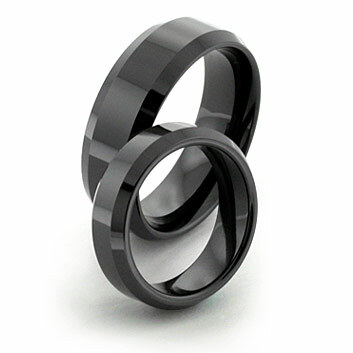 Both the black tungsten rings and black ceramic rings are guaranteed to last and retain their beauty for the long haul. For a unique twist on inlaid titanium rings, we also have rings that are inlaid with black rubber that gives it a rougher, edgier feel. You can go classic with gold, silver or platinum, or go unconventional with black rubber. The choice is yours. And you can be certain that whatever you decide on, you’re going to have a ring that’s going to last you a lifetime.